We are very pleased to announce the hiring of Jared Childress as ACR’s prescribed fire specialist, effective August 13, 2018. As a member of ACR’s science and stewardship staff, Jared will identify and assess units for prescribed fire or other vegetation management treatments on ACR lands and on the lands of our partner agencies and land owners/managers. He will work with our current staff to write burn plans, and interface with fire agencies, the air quality management districts, and our neighbors and community members. 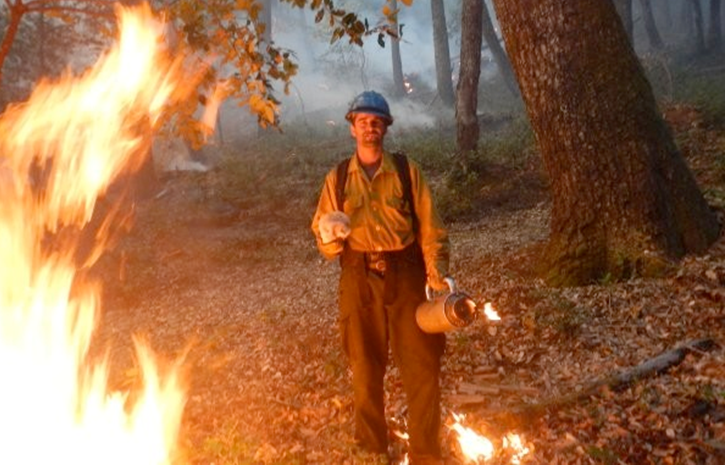 Jared holds a Bachelor’s degree in Environmental Studies from Evergreen State College, a Wildland Firefighter II certificate, has participated in a Prescribed Fire Training Exchange (TREX), and trained as a Wilderness First Responder. Prior to joining ACR, Jared served as the land steward and community wildfire organizer for the East Bay community of Canyon, building community relations between landowners, utilities and state and local fire agencies. Jared’s commitment to the whole system includes community education, most recently as the director of education and watershed restoration at Spaulding Marine Center, and field research, including past experience tracking pumas for UCSC Puma Project, tracking wolves for the Yellowstone Wolf Project, and monitoring coastal rangelands for Point Blue's Range Monitoring Network. Jared is a member of the Central Coast Prescribed Fire Council, Society of Rangeland Management and the California Native Plant Society. Please join us in welcoming Jared to the ACR community!